I have been adding a few more cozy and rustic elements to our Christmas decorations this year. 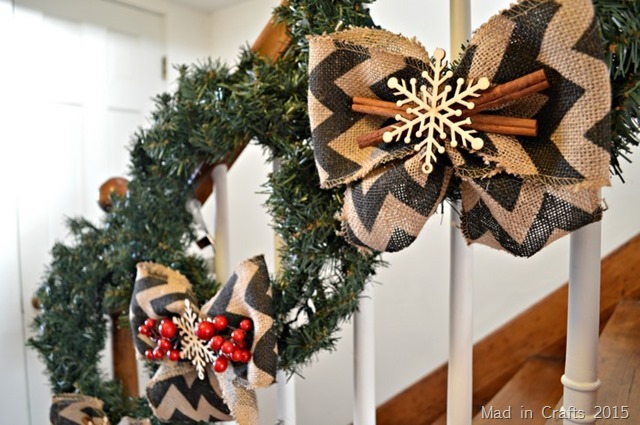 I always hang these three wreaths on our banister at Christmas time, but I wanted to give them a new look this year. I rummaged around in my craft stash and found a few items that I thought would be pretty additions to these simple wreaths. The burlap and raw wood have the rustic texture I was looking for, and the cinnamon sticks and faux berries bring in a natural element too. 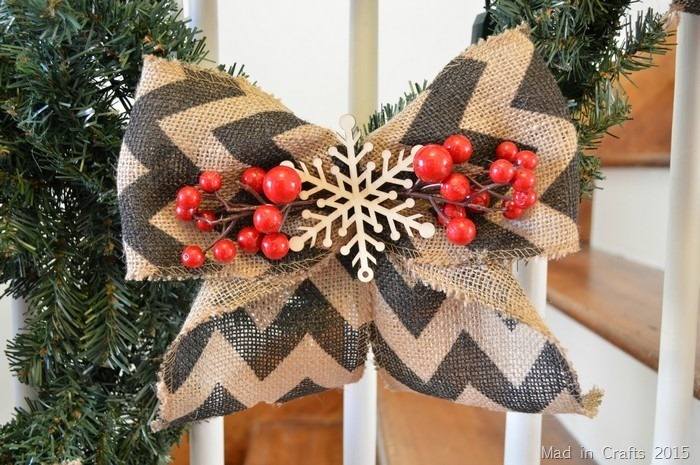 Even though the burlap ribbon has a graphic print, I still this the bows have a timeless, classic style. Because I have been in a gif-making frenzy lately, here’s a breakdown of how I made the bow embellishments. First I made a fake bow using this technique from Made with Happy. I adapted that technique slightly by flipping the hangy down bits of the bow so that the pattern would still show and by using floral wire to hold the bow together instead of twine. Next I placed two cinnamon sticks through the wire at the center of the bow. Finally I used glue dots to secure the wooden snowflake to the center of the bow. 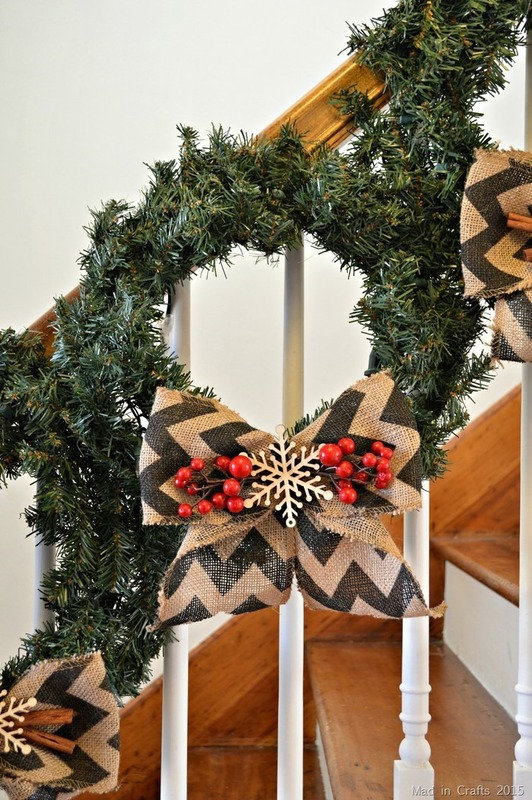 The bows on the outer two wreaths are embellished with cinnamon sticks while the bow in the center has red berries in the center. You are also getting a glimpse of our refinished steps in these pictures too. It’s a process that started over a year ago, and which will be totally finished… eventually. Even though these are pre-lit wreaths, I am choosing to not plug them in this year. We don’t have any outlets in our entryway so I have to stretch an extension cord into the living room in order to reach the stairs. I got sick of tripping over the cord each year, so this year these wreaths are staying dark. I am participating in another holiday décor tour, so be sure to visit all the other bloggers on the list below for many more creative decorating ideas! We love your wreaths! And what a great idea with the cinnamon sticks…too cute! I love the bows on your wreaths! They are perfect! It has been fun touring with you this week! 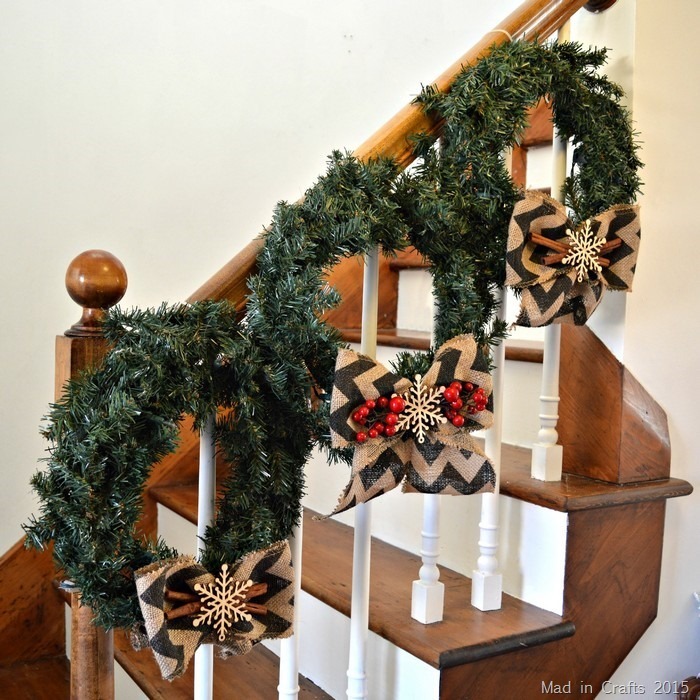 I never thought about hanging wreaths on a banister like that. They look fabulous! 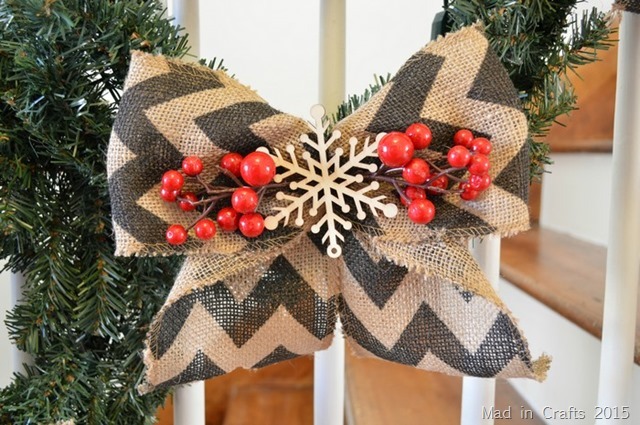 Love the chevron burlap bows! 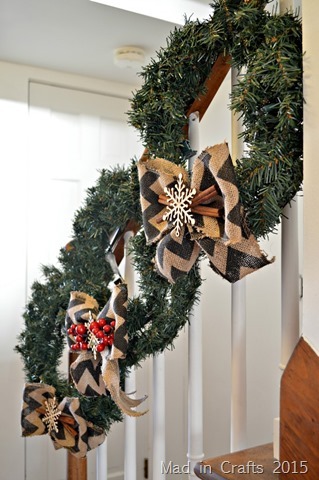 Your wreath trio is the perfect way to embellish your stairs. The bows that you crafted look great and I liked how your picture changed to show me exactly how you got the look. Cute idea for bows – love burlap ideas for the holidays! How fun adding cinnamon sticks to your wreaths. I’ll bet they smell great as you walk by. Happy Holidays! I don’t know why I haven’t thought of the cinnamon sticks! They are a perfect touch. I will be working them into my décor asap! Beautiful idea to dress up your wreaths! Thanks for sharing! These are so cute! 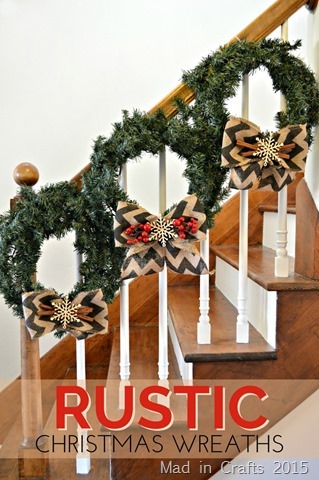 And they look perfect on your handrail! Thanks so much for sharing. The wreaths super cute and I bet your staircase smells delicious too!